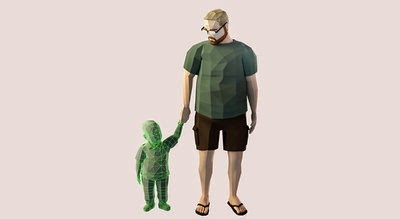 THANK YOUR FOR PLAYING is the story of the making of a computer game that deals with the loss of a child from cancer. The film is a gut punch of the film that makes you feel what the parents are going through as they deal with the impending loss of their child as they are creating a game to help others, and especially themselves deal with the loss. Hubert and myself saw the film last year at Tribeca and it was the source of many hours of debate not only between our selves but also several others including Alec who dove into the video game aspects of the film. When the film was announced for getting a release to theaters and VOD this month I emailed the PR people and told them that I had tons of material on the film and that I would be more than happy to weave together a review for the upcoming release. While I don't have what you could call a real review to rerun I do have to say that THANK YOU PLAYING is a kick in the heart film. Its a film that puts you into the lives of a family who are experiencing a great loss and trying to turn it into something positive. Its a film that will stay with you when other films have left. I saw 90 films at Tribeca last year and I sure as hell remember THANKS FOR PLAYING. It you want a film that is going to haunt you and stay with you then you absolutely must see this film.